Donald Galleck is escorted into the courtroom before his arraignment at the Penobscot Judicial Center in Bangor Tuesday afternoon. He was charged with the alleged killing of Jason Moody, 40, of Bangor. The 29-year-old man charged in the brutal November beating death of 40-year-old Jason Moody unintentionally broadcast the incident over Facebook video live while his phone was in his shirt pocket, according to the court affidavit. Donald Galleck was charged last year with depraved indifference murder and intentional or knowing murder in the death of Moody, who lived in Bangor. 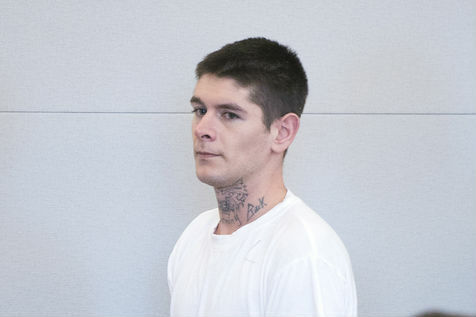 Galleck, who had no permanent address, pleaded not guilty Tuesday at the Penobscot Judicial Center in Bangor. Details about the alleged crime were made public after Galleck’s brief arraignment before Superior Court Justice Ann Murray. The affidavit had been sealed since Galleck’s arrest Nov. 16. The investigation that led to Galleck being charged began Nov. 11 when Moody was found unconscious at about 10:40 p.m. when Bangor police responded to a report of an injured man at the intersection of Center and Cumberland streets. Moody was taken to Northern Light Eastern Maine Medical Center, where he died from his injuries Nov. 13, the affidavit said. Galleck got into a confrontation with Moody after he was asked to leave Moody’s Willow Street apartment because Galleck was fighting with his girlfriend, the affidavit said. The two men left Moody’s apartment and allegedly went to an apartment on Curve Street where Galleck hoped to spend the night, but no one was home. Sometime after that, as Galleck and Moody left the Curve Street apartment, Galleck called a friend using the Facebook Messenger app on his phone while Moody walked behind him, according to the affidavit. A few minutes later, the woman received and accepted a video chat request from Galleck. He allegedly sent the video request accidentally when he put the phone in his pocket. The woman ended the call, according to the affidavit. It is unclear from the court document whether the Facebook chat was saved or could be retrieved by investigators. The medical examiner concluded Nov. 14 that the cause of Moody’s death was “massive inflicted trauma to the brain,” according to the affidavit. Moody’s death was ruled a homicide. Another friend of Galleck’s turned a bloody sweatshirt that she said belonged to Galleck over to Bangor police Nov. 14, according to the affidavit. She told police that Galleck came to her home on Division Street in Bangor at about 11 p.m. the night of the beating “looking panicked and breathing hard.” Her apartment is a few blocks from where Moody’s body was found. Galleck asked to use her bathroom and the woman let him in, according to the affidavit. After he left, she found the hooded sweatshirt Galleck had been wearing in her bathroom. She kept it in a garbage bag in her apartment until she saw a news story that said police were looking for Galleck in connection with a death and decided to turn it over it to investigators. Police located Galleck hiding in an apartment on Fifth Street. He refused to speak with police about his interaction with Moody and requested to speak with defense attorney Wendy Hatch of Waterville, who had represented him in the past. On Tuesday, after Galleck pleaded not guilty, Murray tentatively set his trial for March 2020 in Bangor. She ordered that Galleck continue to be held without bail at the Penobscot County Jail, which is not unusual in a murder case. About half a dozen of Moody’s friends attended the brief hearing. Shortly after his death, Moody was remembered by family and friends as a talented musician, a diehard metalhead, and a devoted and caring friend. The Rockland native moved to Bangor in 2013. If convicted of murder, Galleck faces between 25 years and life in prison. Unrelated to the homicide, Galleck also was charged on July 24 with domestic violence assault, a Class D crime, and violating his bail conditions, a Class E crime. He has pleaded not guilty to both charges. Class D crimes carry a maximum punishment of 364 days in jail and a $2,000 fine. Class E crimes carry up to six months in jail and a $1,000 fine. Galleck is to be tried on those charges April 5 in Bangor.